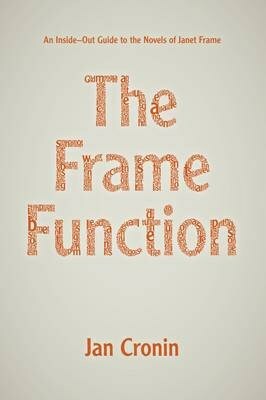 The Frame Function: An Inside-Out Guide to the Novels of Janet Frame, by Jan Cronin, (Auckland University Press, 2011), 222 pp., $49.99. Janet Frame’s 1979 Living in the Maniototo is her penultimate novel and one generally regarded, as Jan Cronin says in her book, as some kind of creative manifesto. The headings of the different parts of the novel are a set of instructions to the reader, predominantly about ‘paying attention’. If these instructions reflect Frame’s sense of her reader, or rather, to adapt Cronin’s title, the ‘reader function’, then paying attention might be something she thinks the reader already does (but not well) or does too much, or does not do enough, and there won’t, of course, be anything simple about what Frame might or might not be saying, but if it is possible to have a reader who pays enough of the right kind of attention, then that person is Jan Cronin. The Frame Function picks up from a phrase coined by Patrick Evans in an obituary in 2004, the ‘Frame effect’, which described the way he thought that ‘as readers, each of us is … under her control whenever we read her and required to perform – to solve’. Frame referred to her fictions as ‘explorations’ rather than novels and the questions that have absorbed, intrigued and teased scholars over the duration of her work relate to the ways in which they do not conform to habitual reader expectations. The narrative will never arrive a point where all becomes clear and you are offered ‘closure’. And the reason her novels never reach a reassuring destination is because the author (or rather her many stand-ins because you are never allowed to rest in the comfortable arms of a reliable narrator) is always at your elbow troubling the waters of comprehension. Cronin, adapting the ‘Frame function’ from Foucault’s famous term for the author, bases her ‘guide’ to Frame on the ‘authorial presence’ in Frame’s novels and how that presence impacts on the reader. Cronin opens with a wonderful example of Frame playing with her reader’s attention in The Adaptable Man. Over breakfast Russell Maude, the village dentist, his wife Greta and their son Alwyn are being treated to a reading of Anglo-Saxon poetry from Russell’s brother, Aisley, a clergyman who is convalescing with them. Misquotations and mistranslations are exchanged across the table cloth, Frame setting traps for an unwary reader who has done Medieval English 1 and thinks they know some Anglo-Saxon verse. Cronin notes that there is no question of Frame simply having made a mistake about which translation matches which Anglo-Saxon poem. Later in the text translated lines from ‘The Wanderer’ are repeated and matched with the correct Anglo-Saxon original. There are other ‘mistakes’ too, which are harder to classify, and like the good scholar she is, Cronin checked Frame’s ms and various editions of the novel and concluded, to her relief, that the reader ‘could not rely on the empirical author to clarify the text’. But at the same time the ‘wilful authorial presence in the text was such that it wouldn’t allow the reader to disregard it’. Of course this is not a new insight in Frame studies. No one can read Frame and not become aware of the author playing cat and mouse with the reader, but what Cronin offers in The Frame Function is a detailed, erudite, clear and illuminating account of Frame’s novels and what she calls Frame’s ‘MO’ — how they work. Cronin acknowledges that her own MO, the ‘inside-out guide’, might be seen as ‘making an implicit claim to know the text better than Frame, to have access to a textual endgame of authorial interests and choices’, but she is always at pains to disavow the potential hierarchies of this position. Instead, she asserts that the ‘Frame function’ and the inside-out guide are two sides of the same interpretative coin. So does it help? The answer is unequivocally that yes it does. Cronin delivers a very lucid and highly informed guided journey through corpus of Frame’s fiction, discussing the novels in roughly chronological order, and using each chapter to open out a more complex examination of the ‘prescriptive authorial presence’ and how the novels work. As she repeatedly notes, her interpretive labours are more focused on the how and not the what of Frame’s fiction, reflecting Frame’s own focus, as expressed in an interview with Elizabeth Alley, on the ‘pattern of things’. Towards the end of this comprehensive and learned book, the person she refers to as the ‘empirical author’ appears in her ‘own voice’ (the trouble with reading Frame is one’s heightened apprehensions of the chasms buried in that taken-for-granted, everyday kind of phrase) in quoted interviews and letters. These notes from the deep don’t really say anything that authors through the ages haven’t always said. For example she commented to Susan Chenery that ‘when you are writing you think you know what you are going to do but it gets organised for you’. This is not really any different from the old chestnut of characters taking over the narrative, but where Frame is unlike other people, the source of her great difficulty and treasure is how she changes her reader’s alertness to, and awareness of, the otherworld of the text. Where does the text stop and the world begin? Cronin shows, with expertly heightened attention, how shifty and cunning Frame and her texts are, and how complex and unfinished the reader’s experience will always be. This is not a book for a casual reader. Cronin declares at the outset it is for those who have ‘acquired a taste’ for the novels of Janet Frame, and the book is primarily geared to a scholarly audience. Undergraduates looking for an easy fix to an essay won’t find their answers here. It is a guide more in the sense that Virgil is Dante’s guide through the Inferno — there are still complex mysteries. Cronin deploys the metaphor of the guide in her own syntax, which is the only thing about her book that I found irritating — the reader is always part of an armlocked ‘we’. But Cronin’s image for Frame’s novels suggests, I think, the expansions offered by her own text. Cronin says the image that sticks with her is the blue police box — yes the TARDIS, in which Doctor Who travels to new worlds — bigger on the inside than on the outside. This is true of both authors and their texts. The Frame Function won’t be the last word on its subject, but it will be a must-read for anyone trying to write about or get to grips with the work of our most extraordinary, gifted and elusive author. LYDIA WEVERS is the director of the Stout Research Centre at Victoria University. Her most recent book is Reading on the Farm: Victorian Fiction and the Colonial World (VUP).